Does this sound like a good idea to you? TheEmmi Dental Professional ultrasonic toothbrush costs about the same as thePhilips Sonicare DiamondClean SonicorOral-B Pro 7000 SmartSeries. However, it looks like it's been designed by a 10-year-old, barely feels like its moving when you put it in your mouth, and requires 'special' toothpaste that, as it just so happens, is made solely by Emmi Dental. Yeah, don't all rush at once. However, if you can get past that and a few other deficiencies, the Emmi Dental Professional ultrasonic toothbrush does its core job of cleaning your teeth and maintaining the integrity of your gums very well. 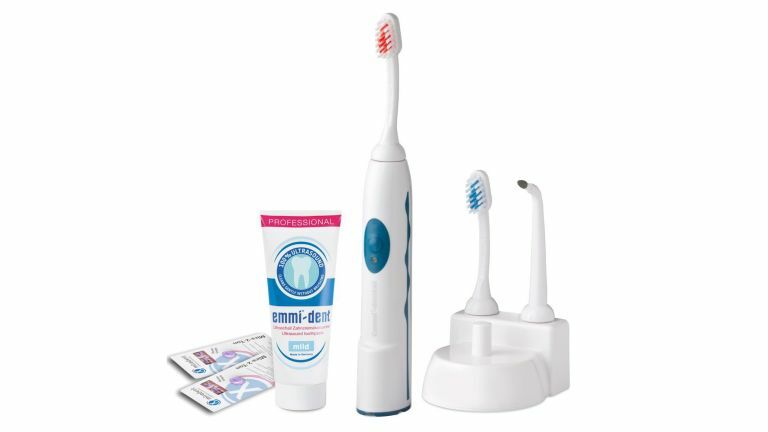 The Emmi Dental vibrates rapidly, in a similar fashion to Philips' Sonicare brushes. However, it actually vibrates far more rapidly, to the point where individual movements are barely perceptible. Unfortunately that means when you bung it in your gob, it feels like it's doing nothing at all, which is not a promising start. However in conjunction with Emmi Dental's own toothpaste - called Emmident, which will please lovers of Flight of the Conchords everywhere - this ultra-rapid oscillation blasts micro bubbles between your teeth. Well, supposedly. All this is very hard to verify as a user, but what we can confirm from using disclosing tablets is that cleaning is very good, and pretty much on par with bigger name rivals. Some users online have reported it's good at removing heavy staining from teeth - from smoking or years of bad dental hygiene or what have you - but we can't really confirm or deny that, as our teeth are actually okay. At around £120, the Emmidental is in line with its big-name rivals. The brushes are also comparable at about £20 for four, which should last you 9-12 months. The 'special' toothpaste is a further £4 a tube and you MUST use it. The Emmi Dental for sure does not look like its built to last - it's lightweight, plasticky and cruddy looking - but appearances could be deceptive. Battery longevity can become variable as electric toothbrushes age, but in its first month we only needed to recharge this thing once. That is far better than its rivals. Presumably the minimal movement of the brush head means only a low powered motor is needed. Fully recharging takes around 24 hours, which is in line with its rivals. Well, it's hideous, isn't it? The Emmi Dental Professional ultrasonic toothbrush also lacks any kind of timer or other means of telling you when to move to the next area of your mouth, so you'll have to do work that out for yourself. There are also no cleaning modes other than the standard one. But then to be fair, so what? We never use any of the other modes on our Oral-B or Philips brushes. What is clever, design-wise, is the way this thing actually cleans. It's gentle, seemingly requires little energy and is demonstrably effective, although not necessarily any more so than Oral B or Philips toothbrushes in the same price bracket. One other differentiator is a scary looking interdental tool which, in conjunction with the 'special', gap-filling toothpaste, could reduce your need to floss. Which can only be a good thing. This is a niche gadget for teeth-obsessed tech nerds. And there is nothing wrong with that. For those with sensitive teeth and gums, it could be a very good investment, because the cleaning action is so gentle, you can barely feel it. On the other hand, it looks and feels terrible, despite being no cheaper than the flagshi devices from Oral-B and Philips. It doesn't have a timer - something we've come to rely on when using other electric toothbrushes - and it requires you to buy special toothpaste at a premium, online. That's why, despite being a fine product in some respects, we struggle to recommend the Emmi Dental Professional ultrasonic toothbrush wholeheartedly.